It is clear that we have just witnessed the largest single worldwide protest against a company and their products. What is also clear is the major public disgust for anything bearing the words 'GMO'. 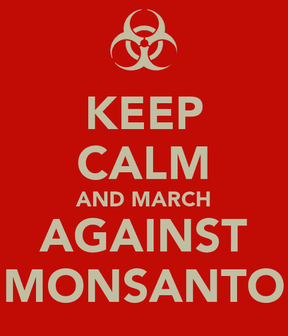 Monsanto's only refuge lies in massively funded mouthpieces in the form of news clips and certain public figures, combined with a legal stranglehold on scientific research and medical inquiries. Yet in the age of information, their propaganda is laughable. Meanwhile the townspeople gather, having replaced their torches and pitchforks with signs and banners. We see this time the battle being fought from a place of higher consciousness. Our weapons of choice are the devastating methods of non-compliance, civil disobedience, and free enterprise. It appears while the smoke is still clearing from what may be the final March Against Monsanto, momentum favors the people. Tipping points are historically difficult to pinpoint or predict. They often manifest in the form of some event or consciousness action that ignites the minds of the public in a “now I can see” moment. During that exact second, and no sooner, a mass movement locks into a single idea that once cemented in stone, will never die. We are at such a point. The once obscured battle lines in the sand have now been illuminated with neon signs, doused with gasoline, and set ablaze in our collective DNA. Into the future we march knowing only one thing clearly, genetically modified food will not be a part of it.